Short term measurement of investor sentiment remained in neutral territory this week. That makes it difficult from a contrarian point of view to predict market direction for the near future. 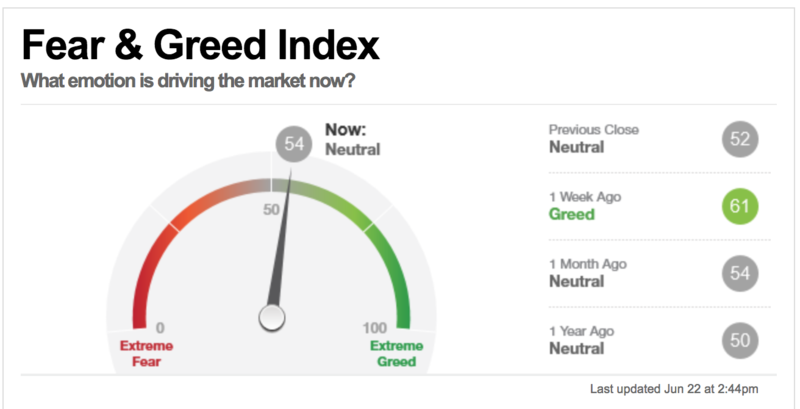 The CNN Fear & Greed Index moved to 57 while the Ned Davis Research (NDR) Short-Term Sentiment Poll rose to 62 from last week’s 52. I would rate this neutral at best. On the other hand, long term sentiment jumped quite a bit over the last week, flashing warning signs for stock investors. NDR Crowd Sentiment climbed to 67. Anything near 70 or more means investors should be careful. 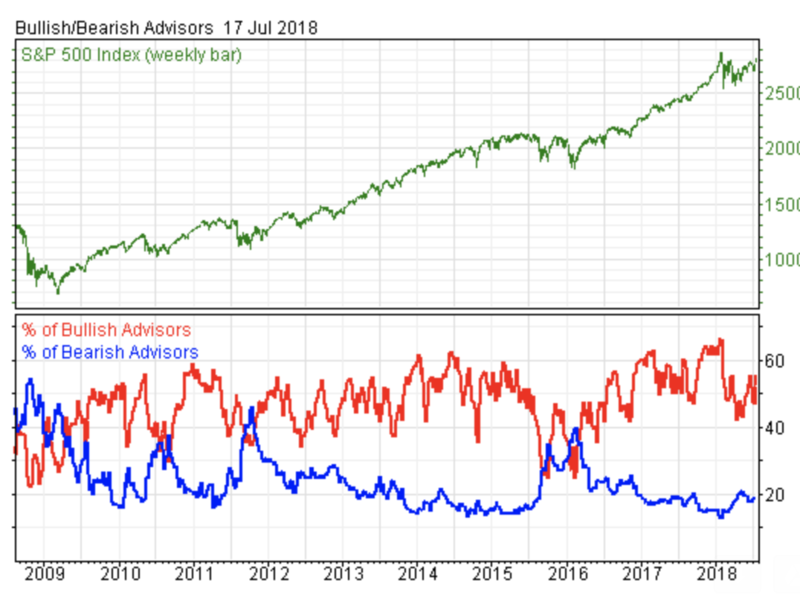 The Investors Intelligence Bull/ Bear measurement of sentiment among investment newsletter writers moved to 55% bullish from 52%. The bears remained about the same at 19%. Since these writers are historically wrong, the Bull/Bear poll also is telling investors to watch out. The US Stock Service and the US Market Timing service are provided by Chartcraft Inc (“Chartcraft”), which is not a regulated business. All other services are provided by Stockcube Research Limited (“Stockcube”) which is authorised and regulated by the UK’s Financial Conduct Authority. Chartcraft and Stockcube are wholly-owned by Stockcube Ltd, a UK company registered in England. Long term sentiment remains stubbornly high. NDR crowd sentiment is at 62, which is on the lofty side. The Investors-Intelligence bulls/bears came in it at 52% bulls and 19% bears, which remains high. The spread also remains a bit wider than we would like, continuing to show intermediate term complacency. Short term gauges have retreated further due to trade fears. 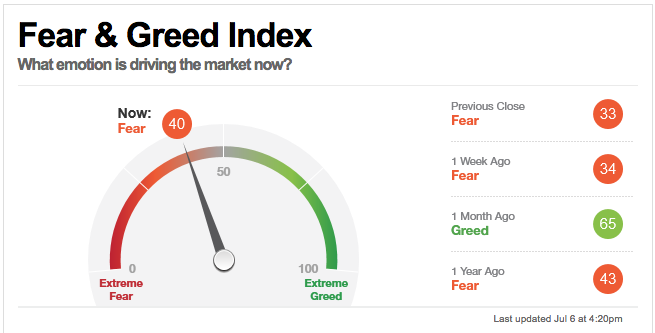 The CNN fear/greed indicator fell to 33 from 37. This number is now on the low side of the ledger. The NDR short term sentiment gauge fell to 42 from the mid 50’s, which is also a short term positive. Intermediate term indicators remain stubbornly on the high end of their range. Investor’s Intelligence bulls/ bears was 47% bulls and 19% bears, while the NDR crowd sentiment number came in at close to 60. A major bottom tends to occur when the intermediate sentiment is oversold, which has yet to occur. Short term bounces are coming in on a deteriorating tape. Investors should remain patient and wait for gauges to move into oversold territory. Short term gauges have retreated after two weeks of selling. The CNN fear greed index is at 37, down from the mid- 50’s last week. The NDR short term sentiment gauge is at the mid-50 range, down from a recent peak of 85. While we are off the highs, the numbers haven’t entered into buy territory yet. Bulls/Bear’s came in at 47% bulls and 18% bears. This leaves the Bull/Bear spread at 29%, which is still wide and far from a buy signal. NDR Crowd Sentiment also remained elevated at 66% bullish, far from a buy signal. Short term sentiment pulled back this week a touch. 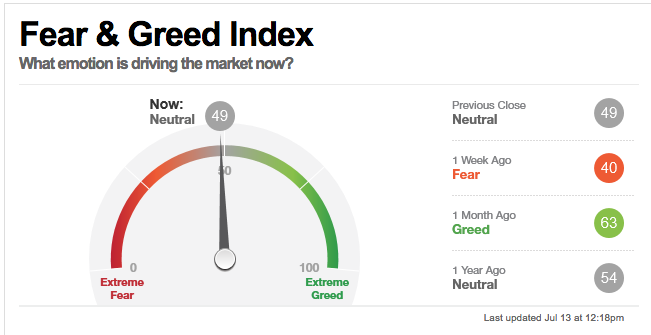 The CNN Fear greed index is neutral at 57.